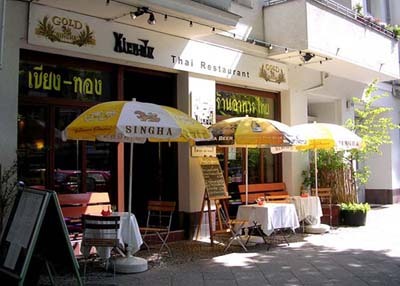 Since May 1973 the Restaurant "Kien-Du-Kiang-Thong" is well-known for his exquisite kitchen far over the borders of Berlin and being popular.Always stayed loyal to the initial concept, become Specialties served from the northeast of the country. The "Home-Made-Curry" in his different variants is regarded as unrivalled. During the entry into the Restaurant "Kien-Du-Kiang-Thong" the look falls first on the Buddha-shrine, the heart of the room. 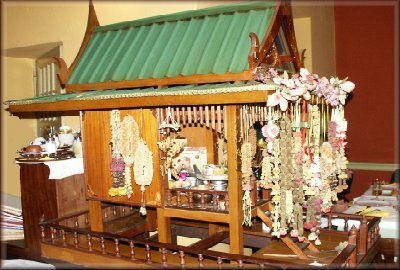 The consecration house is decorated with small garlands all over. At the ridge sparkle very thin small gold plates. With fresh foods, drinks and equipped joss sticks. Our employees thanks everyone Day again for the welfare of Buddha and honor him with small presents.